11. "My name is Lassie and I'm a German Shepherd"
Last week's challenge: The numbers 5,000, 8,000 and 9,000 share a property that only five integers altogether have. Identify the property and the two other integers that have it. Puzzle answer: When written in words, these integers have the five vowels A, E, I, O and U exactly once each. The other two integers with this property are 6,010 and 10,006. Puzzle winner: Sam Levitin of Worcester, Mass. If you know the answer to next week's challenge, submit it here. Listeners who submit correct answers win a chance to play the on-air puzzle. Important: Include a phone number where we can reach you Thursday, Feb. 2, at 3 p.m. ET. What a week - lots of change. But there's always one thing you can count on staying the same. It's time for The Puzzle. GARCIA-NAVARRO: Will Shortz is the puzzle editor of The New York Times and WEEKEND EDITION's puzzle master. Good morning. GARCIA-NAVARRO: So I'm new to this. And so I have a few questions. I'm curious. How do you put The Puzzle together? How do you think of them? SHORTZ: Well, I just play around with words in my head. I find the best time to do that is in bed. I don't know. SHORTZ: Do you get new ideas in my bed? Yeah. SHORTZ: Get some of my best ideas then. And, sometimes, I wonder, after 30 years, am I ever going to run out of ideas? But so far, so good. GARCIA-NAVARRO: So far, so good. And listeners send you puzzles, as well, right? SHORTZ: This is the medium. Something that's too complicated that you need to read - that doesn't work. Something that's changed over the years - there's a lot of tools online now for solving puzzles. 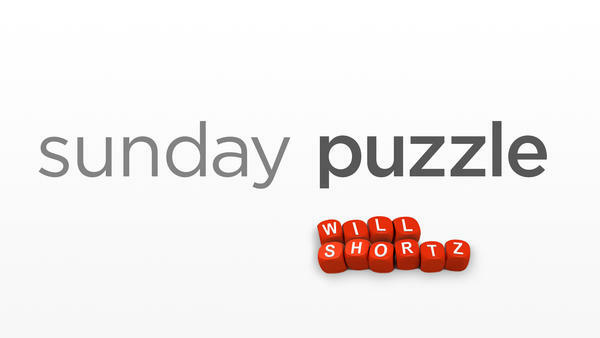 SHORTZ: And I try to use challenge puzzles that are - can't be too easily solved online. GARCIA-NAVARRO: All right. Last week's puzzle came from one of our listeners, right? SHORTZ: Yeah. It came from Dan Pitt of Palo Alto, Calif. And I said the numbers 5,000, 8,000 and 9,000 share a property that only five integers altogether have. And I said, identify the property and the two other integers that have it. Well, when written in words, these integers have the five vowels A, E, I, O, U exactly once and no Y. And the only other two integers with this property are 6,010 and 10,006. GARCIA-NAVARRO: We received more than 500 responses. And the winner is Sam Levitin him from Worcester, Mass. Nice job, Sam. GARCIA-NAVARRO: Are you ready to play The Puzzle? SHORTZ: All right. Every answer today is a made-up, two-word phrase in which the first word has six letters. The last three letters spell the second word that will complete the phrase. For example, if I said a scurrying insect whose appearance has been affected by radiation, you would say mutant ant. Here you go - number one. SHORTZ: A heavy weight in Massachusetts' capital. SHORTZ: That's right. Number two - a hero pilot who lives in a royal home. SHORTZ: There you go. You have it. Palace ace. Just take the last three letters - palace ace. SHORTZ: OK, good. Here's your next one, a young lady who is very careful about spending money. SHORTZ: A container from Mr. Spock's home planet. SHORTZ: A bear's home that is concealed. SHORTZ: Uh-huh. Prohibition on headwear for Sikhs. SHORTZ: That's it. A collection of things in the room where you store clothes. SHORTZ: Uh-huh. A thin line of seats in a theater. SHORTZ: Uh-huh. Boston basketball players' peculiar mannerism. GARCIA-NAVARRO: You're on a roll (laughter). SHORTZ: That's it. I tell you. SHORTZ: What an Italian tourist city has when its canals are frozen. SHORTZ: Uh-huh. Now here's a quote. My name is Lassie, and I'm a German shepherd, for example. SHORTZ: That's a collie lie. Meat sold in Batman's hometown. SHORTZ: Uh-huh. Mafia chief in England's capital. SHORTZ: That's it. And your last one is how things are done in Oslo. SHORTZ: That's the Norway way. Good job, Sam. GARCIA-NAVARRO: That was really, really good. You were fast, too. For playing our puzzle today, you'll get a WEEKEND EDITION lapel pin as well as puzzle books and games. You can read all about it at npr.org/puzzle. Sam, what member station do you listen to? GARCIA-NAVARRO: One of the best. Sam Levitin of Worcester, Mass., thanks for playing The Puzzle. GARCIA-NAVARRO: All right, Will. What's the challenge for next week? SHORTZ: It's an odd one. It's an original. Take six different letters. Repeat them in the same order. And then repeat them again, making 18 letters altogether. Finally, add T-E-B-A-S-K-E-T at the end. And if you have the right letters, and you space them appropriately, you'll complete a sensible sentence. What is it? So again - six different letters. Repeat them twice so you get 18 letters altogether. Add T-E-B-A-S-K-E-T at the end. And if you have the right letters, and you space them right, you'll complete a sensible sentence. What sentence is it? GARCIA-NAVARRO: When you have the answer, go to our website, npr.org/puzzle, and click the submit-your-answer link. Just one entry per person, please. And our deadline for entries is Thursday, February 2 at 3 p.m. Eastern. So include a phone number where we can reach you at about that time. If you're the winner, we'll give you a call. And you'll get to play on the air with the puzzle editor of The New York Times and WEEKEND EDITION's puzzle master, Will Shortz. Thanks so much, Will. SHORTZ: Thanks a lot, Lulu.